Remember those super delicious, chunky double-choc cookies from your childhood? A real treat weren’t they? 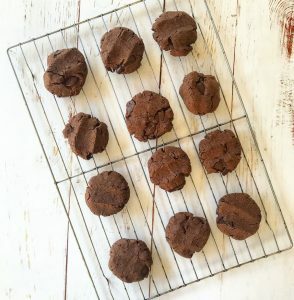 Well I was craving some the other week so I decided to tweak an old recipe for sugar-loaded traditional whole-wheat flour cookies to make this version of Chunky Double Chocolate Gluten-Free Cookies. Don’t get me wrong, these are still a treat item but they’re slightly healthier :). Super delicious and if you’re a dark chocolate lover, you’ll LOVE these. If not, add a little more honey :). Did you know that chocolate is actually quite good for you? Raw cacao (found in this recipe) is packed with antioxidants, vitamins and minerals like calcium, magnesium, sulphur, copper, iron, zinc, potassium, monounsaturated fat, and vitamins E, B2, B1, B5, B3 and B9. The issue with many chocolates out there is the sugar content and addition of preservatives and emulsifiers like soy lecithin and dairy which doesn’t always sit well with everyone. I am IN LOVE with the pure 100% cacao, Changing Habits Pure Cacao Melts are the absolute bomb! 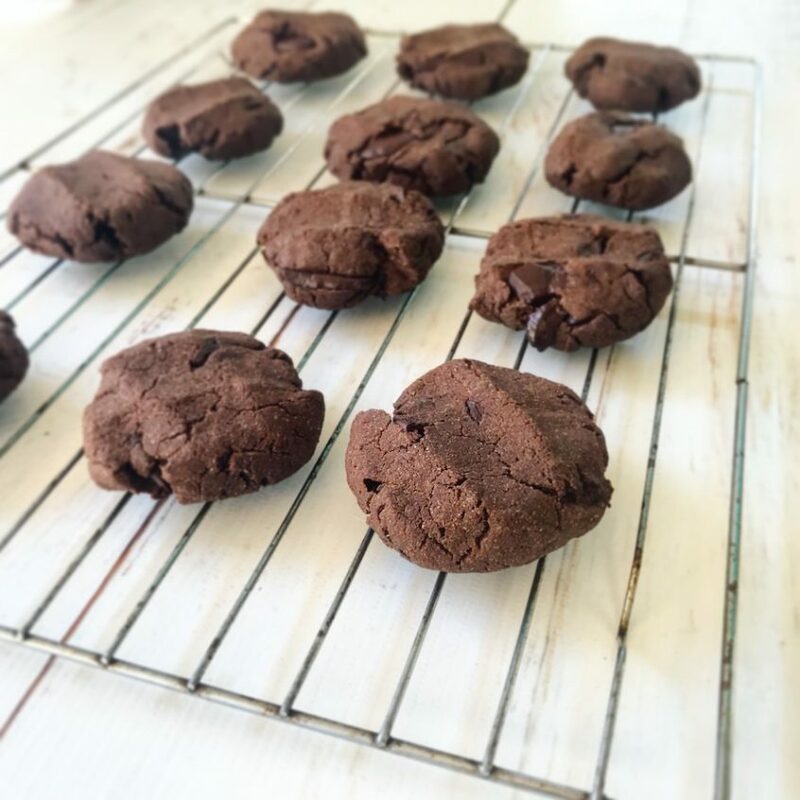 The melts are literally just cacao beans ground into a paste and set into coin-sized melts that you can use as you need in cooking like these Chunky Double Chocolate Gluten-Free Cookies! 2 tsp vanilla powder or extract. 2 T honey or natural sweetener of choice (more if you have a sweet tooth). *You could use grass-fed butter, organic coconut oil, macadamia oil, extra virgin olive oil or any combination of these so long as the total weight is 125g. Preheat oven to 160degC. Line 2 baking trays with baking paper. Combine the dry ingredients, including the chopped Cacao Melts, in a mixing bowl. Warm the oil/fat and honey in a pot over the stove, stirring/whisking to combine. It shouldn’t bubble or anything, just heat it enough to soften the honey and butter/coconut oil and help them mix. Remove from heat once combined and add vanilla and egg. Add wet ingredients to dry and combine well. Take tablespoon-sized portions of cookie dough mixture and mould into balls and place on the trays, press down on the balls with your fingers or a fork to form a cookie shape. Bake in the oven for 10-15 minutes. Time will depend on your oven and on how you like your cookies (shorter time for “still a little gooey inside” and longer for “cooked all the way through”). Remove from the oven and transfer to a wire rack to cool. Store in an air-tight container in the pantry for up to a week. You can also freeze these Chunky Double Chocolate Gluten-Free Cookies for use later.